I know, I know, it sounds like a criminal, but I promise I am not that kind of perp. Purps is short for Purple Girl, a nickname I earned by wearing purple nearly every day and running around college in a purple hat and blanket. As with all good nicknames, it was given to me by people I didn’t know. I then started dating one of them and the name came out. Now, you might think it silly or childish, perhaps, to hold on to a college nickname, but I say why not? It is a part of me that I enjoy and it won’t be changing any time soon. When I was in high school I was known for my pointless stories. I have this habit of just kind of saying whatever pops into my head, sometimes. I enjoy sharing my life in little ways with the people I’m with. Some days it’s an adventure that I had getting to the mall. Some days it’s this crazy thing my cat did. Some days it’s a cooking disaster I had with my husband. I am a simple person and I like simple stories. Sure, sometimes I think about big complex concepts. Sometimes I’ll put my two cents in on what’s going on in the world or on the internet or what have you. But for the most part, it’s just me and my thoughts here. The kind of thoughts you have with a friend over coffee. So now that we are friends, and I encourage you to enjoy a hot beverage of your choice while you read, I suppose you should get to know me a little bit. I like purple. That much has been made fairly obvious. 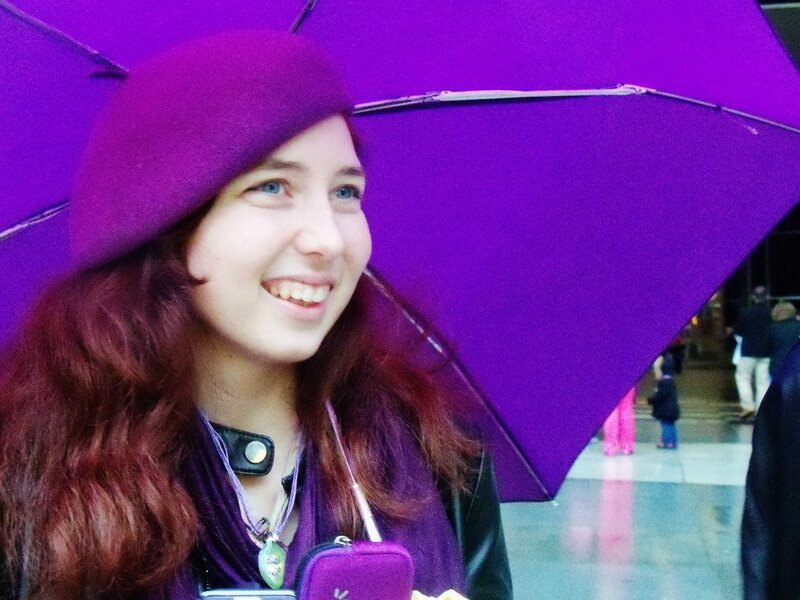 I’ve liked purple since early high school and it has kind of permeated my entire life. Most of my wardrobe is purple, my coffee mugs are purple, my pillows are purple. I’m a pretty purple person. I got married in July of 2014 to this really awesome guy I met in college. He’s a computer programmer, a comic book geek, a cooking enthusiast and a beer snob. He’s also cute, funny, sweet, loving, and pretty much wonderful in every way. I know he sounds dreamy but, sorry ladies, he’s mine. I’m a cat person. Like a big cat person. I grew up on a sort of farm with at least three cats at all times. They were outside cats, employed in killing rodents that ate feed and such, but they were sweet and had a habit of reproducing every spring and fall thus giving us more tiny cats to snuggle. My current apartment doesn’t allow cats, which is the saddest of sad things, but both my family and my husband’s still have cats, so we snuggle them when we can. I really like Captain America. I have a plushy of him which I carry around with me and take pictures of in new places. Yeah, I’m that kind of person. I’m slightly less into comic books than my husband, but only slightly. My favorite genre is fiction, specifically fantasy. I’ve tried writing realistic fiction and it just doesn’t work. I enjoy the ludicrous and absurd situations you can get into when magic and dragons are involved. Plus I can make up whatever I want about the world and it becomes true. Much less research is required that way. I’m not great with the magic systems, but I’m pretty fond of my dragons. I’m the middle child of two middle children. My parents came from families of nine and seven children and each was smack dab in the middle of either line-up. I have an older brother who taught me to love video games and a younger sister with whom I enjoy sporadic coffee adventures and talks about life. So there you have it, a little bit about me. I hope you enjoy your time here, peeking into my brain and thinking about things with me. I think we’ll have a lot of fun together.